With their ability to make you the belle of the ball, the Bulgari Intarsio Pink Gold and Mother-of-Pearl Earrings are a quality investment. Wear them to dress up your job attire when you have an after-work dinner date, or give them as an extravagant gift to a beloved family member or a friend. 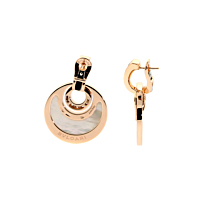 Since the earrings are round pendants enhanced with geometric mother-of-pearl design elements, the jewelry items allow you to share your preference for distinctive adornments while also giving you a way to divulge your classic side.